In partnership with the Smiles for Everyone Foundation, Bright Now!® Dental Provides $40,000 of free dental services to over 60 patients. Bright Now!® Dental partnered with the Smiles for Everyone Foundation and opened its Holiday office to provide free dental services for over 60 underinsured, low-income individuals. Volunteers across Bright Now! Dental offices in West Florida extended their hearts well beyond Valentine’s Day at the February 16th Day of Giving. 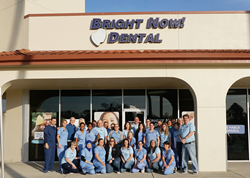 Seven doctors, four hygienists and their dedicated support staff gathered at Bright Now!® Dental in Holiday, FL to remind under-served members of their communities just how much they are cared for. Patients were referred to this heartfelt Day of Giving by local nonprofit organizations, such as Ronald McDonald House Charities of Tampa Bay, Bay Area Youth Services Florida, and The Grow Group, an employment assistance program. Over 60 individuals were on the receiving end of compassion as the Team donated $40,000 in much needed dentistry. Services included checkups, cleanings, oral cancer screenings, fluoride treatments, fillings, extractions, and more. The Smiles for Everyone Foundation would like to thank the entire Holiday Team, including Dr. Girdsnite Boileau, Dr. Krystelle Duvert, Dr. Alan Hecht, Dr. Alexander Marrero, Dr. Keum Park, Dr. Angel Rivera, and Dr. Hector Rodriguez, for all of their hard work and impeccable care. With the help of the fantastic volunteers, they were able to succeed in delivering Smiles for Everyone®! Bright Now! ® Dental provides general dentistry, children’s dentistry and, in select locations, specialty care services such as orthodontics, oral surgery, periodontics and endodontics at over 150 offices across Arizona, California, Colorado, Florida, Indiana, Maryland, Ohio, Oregon, Pennsylvania, Utah, Virginia and Washington. Bright Now! Dental’s Holiday office is operated by Castle 1st Dental Care, P.A., (the “Group”). The Group is affiliated with Smile Brands Inc., one of the largest providers of business support services to dental groups in the United States. Smile Brands Inc. provides comprehensive business support services through exclusive long-term service agreements with affiliated dental groups, so dentists can spend more time caring for their patients and less time on the administrative, marketing and financial aspects of operating a dental practice. Smile Brands is a portfolio company of Gryphon Investors (“Gryphon”), a leading middle-market private equity firm based in San Francisco, CA. For more information, visit http://www.smilebrands.com. The Smiles for Everyone Foundation is a 501(c)(3) nonprofit organization with the mission of delivering smiles for everyone by providing free dental care for those in need, both at home in the U.S. and around the world. Since 2011, the Smiles for Everyone Foundation has delivered over 19,000 smiles and nearly $15 million in donated dentistry. The foundation currently supports programs which provide free dental care to those in need in Cambodia, Ghana, Laos, Nicaragua, Paraguay, Thailand and the United States. For more information or to make a donation, visit http://www.smilesforeveryone.org.